In 1992, Georgia Governor Zell Miller started a pilot program to educate 750 at-risk four-year-old children in twenty schools across Georgia. Three years later, the pilot program became one of the first universal Pre-Kindergarden (Pre-K) programs in the nation funded by the Georgia Lottery. Since then, Georgia’s Pre-K program has become one of the most recognized programs in the country earning recognition from the National Institute for Early Education Research, Harvard University, the Ford Foundation and the Center for the Improvement of Early Reading Achievement. Despite the accolades, Georgia’s Pre-K program has faced challenges related to funding and access that threaten to negate the positive impact of the program. To ensure that all children are ready to learn, we must meet these challenges directly and find solutions that will ensure Georgia’s Pre-K program is truly universal and continues the record of excellence in student achievement built over twenty-one years. The positive impact of a formal education for four-year-olds is supported by research started in the 1960s in Michigan. The Perry Preschool Project was a randomized trial experiment (meaning the results can be contributed to the single factor being tested) where three- and four-year-olds were divided into two groups: one that received a preschool education and another that did not. The children were then followed into adulthood by researchers who measured things like average income, average use of welfare programs like food stamps, arrest records and graduation rates. The Perry researchers found that on average, lifetime earnings for women were $211,000 more and lifetime earnings for men were $145,000 more for those who were selected for Pre-K. Welfare costs declined by an average of $3,000 for men and $1,800 for women. All participants were less likely to be arrested five times by age 40 and more likely to graduate high school. In short, just one year of formal education for the three- and four-year-olds in this study had a significant impact throughout their adult lives. These results helped motivate the expansion of Pre-K throughout the 1990s in states like Georgia and Oklahoma. Georgia’s program has also undergone rigorous research to prove the positive impact formal education has on Georgia four-year-olds. In 2011, Georgia’s Legislature authorized an evaluation of Georgia Pre-K that was completed by the FPG Child Development Institute at the University of North Carolina. Findings from the 2011-2012 school year show that children exhibited “significant growth during their Pre-K year across all domains of learning” including subject areas like language arts and math and skill sets like general knowledge and behavioral skills. Factors that contributed to the growth in achievement included proficiency in English and attending Pre-K in a local school system as opposed to a private provider. UNC’s study shows that Georgia Pre-K is deserving of the great reputation it carries. Despite the positive research results, Georgia Pre-K has faced its share of financial setbacks. Since 2009, lottery funding for the Pre-K program has declined by 7.4% and per-student funding has declined by 22%. School days were reduced from the customary 180 days to 160 days for the 2011-2012 school year and 170 days for the 2012-2013 school year. Class sizes were also raised from 20 students to 22 students in 2011. This increase causes Georgia to miss a quality benchmark from the National Institute for Early Education Research, a prominent Pre-K rating organization. While some of these financial struggles will turn around as Georgia’s fiscal situation improves, others have lingered. 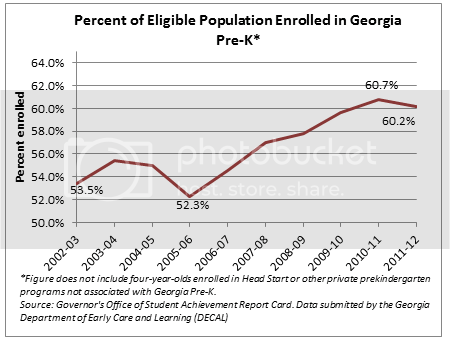 In the Governor’s FY 2014 budget, 6,214 children are on a waiting list to attend Georgia Pre-K. Since 2002-2003, Georgia has never served more than 60.7% of all eligible four-year-olds. This means that over one-third of all four-year-olds are not getting the formal education they need to come to Kindergarden ready to learn. They are entering K-12 education behind their peers, and for some children this gap will only widen as they go through our school system. For Georgia to have a truly universal Pre-K program, we must reach out to the parents of children not currently being served. We must find the resources to admit all children who are on waiting lists as their parents have already decided they want their child in Pre-K. Then, we must make it known that we have cleared the waiting list for Pre-K programs across the state so that parents who want their children in Pre-K but who didn’t sign up because they assumed their names would sit on a list can finally enroll their children. Finally, we must inform all parents that Pre-K is an option for all four-year-olds in the state of Georgia that prepares children for school. If Georgia can accomplish these things, we can maintain our historically strong Pre-K program and ensure all children enter Kindergarden ready to learn and succeed.